Sailing Olympian and America’s Cup skipper, Mitch Booth, has hung out his shingle and opened up in business selling custom carbon cats, the aptly named BlackCat. The world economy might be bottoming out but there’s still plenty of money floating around at the top end of the market and the desire for increasingly large superyachts doesn’t seem to be waning. If you’re going to go bigger, it makes sense to also go wider to maximise your on-water real estate, so multihulls are definitely the way forward. 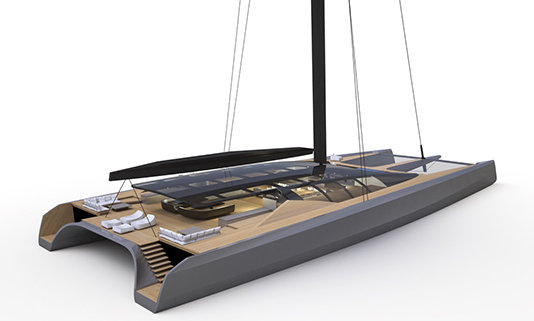 BlackCat will build custom carbon multihulls but they’ve designed a 50 metre concept so prospective buyers have some idea of what the team is capable of. BlackCat’s founder, medal-winning Mitch Booth, is a seasoned catamaran sailor having spent over 40 years racing all types of multihulls picking up a few awards along the way including both Dutch and Australian Yachtsman of the Year. He’s also had a stint as an America’s Cup captain and sailing manager so this is a man who knows his way around a multihull. Working alongside Mitch is his chief designer, Malcolm McKeon. Malcolm is one of the world’s most successful superyacht designers with an impressive portfolio of over 200 boats, 50 of which exceed 30 metres. McKeon was the lead naval architect at Dubois Naval Architects (DNA). After having worked there for 30 years he left in 2013 with the interesting caveat that he couldn’t publicise any of the boats that he had worked on, but suffice to say he has worked on some very big boats. 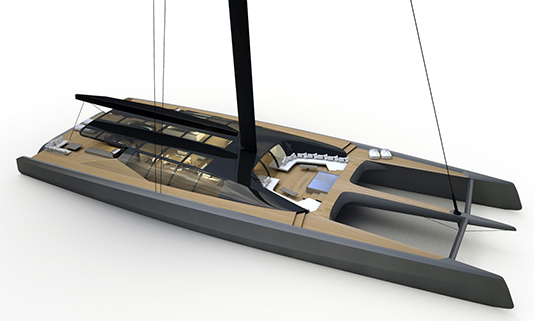 McKeon has been interested in carbon superyacht construction for years and so the collaboration with Booth is a match made in heaven. 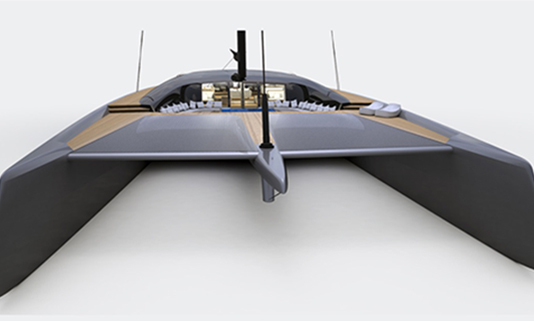 Both men have a passion for carbon and if their BlackCats concept comes to pass then they will be the largest single structure carbon fibre yachts ever built. The BlackCat 50 metre concept has a 20 metre beam so there’s plenty of space for accommodation, a whopping 340m² of it to be precise, and more than enough cabins for friends, family and hangers on. As Booth points out, multihulls’ vast on-board space is only one of the many advantages of a beamy boat. If your sea legs don’t come easily then you’ll love the very low roll and pitch at anchor, which makes for an easier onboard dining experience and lessens the chance of falling out of bed. You’ll also find it easier to keep hold of your G&T while you’re making way as the heel angle is much lower than a monohull and allows you to go about your business rather than clinging on for dear life. Another great advantage is that the stability that comes with a multihull means that you can ditch the keel allowing access to much shallower anchorages than a traditional monohull. These are fast luxury boats, with top speeds estimated between 25 and 30 knots for a 50 metre. They have a beautiful pared down design and there’s plenty of space without building upwards, so she still has the sleek lines of a racer.